Not that I have anything to say mind you, but I promised myself that I would keep this blog fresh. We did have a bright sunny warm day today and that of itself is something to brag about after the cooler weather we have been having. It has been so chilly here that we took our air conditioner out of the window yesterday and stored it for winter. Now THAT is something I am not looking forward to. Nope, not at all, I am actually dreading it. I guess I am just hard to please.. I don't like the heat of summer and I detest the cold of winter. Today's temperature was just right, I would like it to be like this 12 months of the year, that would be perfect for me. I think I am getting a cold, I have been sneezing all night and have a runny nose.. I prefer to call it a snoggy nose.. a combination of snotty and soggy. I dread coming down with a full blown cold, I am such a whimp when I get a cold.. I don't know how normal people can just continue on with their lives as if nothing were wrong when they have colds because I certainly can't do it. I mean I get feeling so miserable that I can barely hold my head up, and I feel like crap. All I wanna do is crawl in bed and curl up and die. Doc gave me the word this week that I should tell my boss that I can only work 20 hours per week and no more. To stand up for myself and not allow myself to get pushed around. I know he is right but I just can't say no to them. Like I said, I am a real whimp. I have had trouble saying no all my life. I guess that is why I was in trouble almost all my life LOL. I really do love my bosses though and always want to please them so that is where the trouble comes in, they just have to look at me and I am falling over myself to please them. They are good to me too and all I have to do is ask them for something and they will see that I get it. I laughingly told him the other day that I needed $22,000 for a new car, and should I just take it from the cash drawer, he looked at me for a minute and said "you really need?" I told him no I was just joking. I think he would have lent it to me if I really meant it. He has lent me as much as a $1000 in the past without a bat of the eye. They gave me the air conditioner that we have and it isn't one of the cheaper ones either, it is one of those fancy programable ones. Like I said, they are really good to me, they just forget that I am not "normal" from time to time and try to work me on a normal basis. I can forgive them for that. 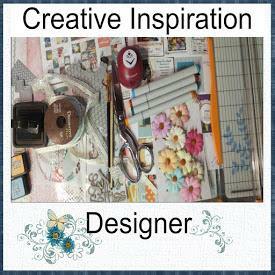 I have been doing a little scrapping, I discovered some sketches for a lot of photos on one layout.. 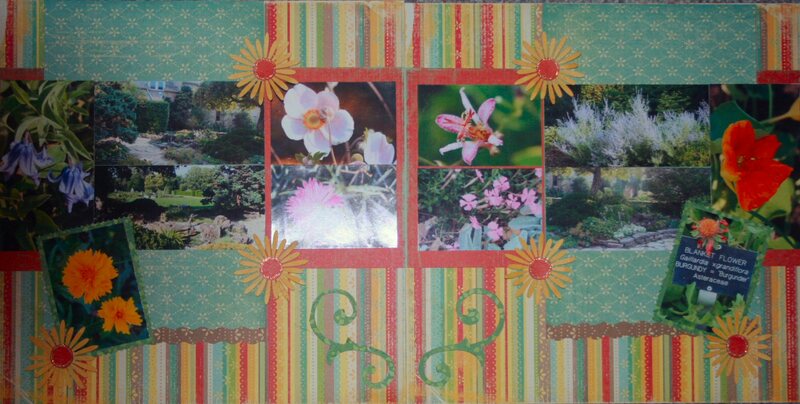 I loved them and used them to make 2 pagers with the photos from the Botanical gardens. I have sooooooooo many photos from there that multi-photo layouts are a necessity. For this first one I used some paper from Kaiser Kraft called "Be Mine". I used the Cricut to cut the flowers, and a MS punch to do the borders. The lace is from Hobby Lobby and the ribbon is from my stash and I have no idea who makes it. Really a simple layout but I love it. Click on the image to see a larger photo. The images all have a little washout from the flash.. sorry about that. This next one I used paper from K & Co, called Wild Saffron.. love that line. I got the pad because I liked it so much. I used the Cricut to cut the scalloped edges, the flowers and the flourishes. I used my scissors to cut the edges of the mats. Once again a simple design but I like it. This one I did for a challenge. We had to use the quote on a layout. I love this photo of Alan. We were on the nature trail and got caught in the rain. We carry those rain ponchos in our camera cases all the time but this was the only time we ever had need of them. 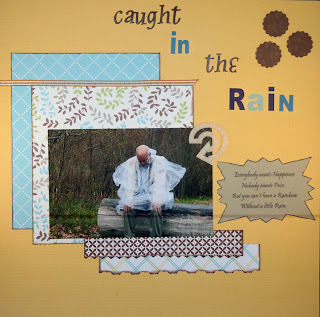 I used MS paper for this layout. I used my scissors for the edges. I used some of the shapes that come with Paint Shop Pro and converted them to SVG files in Inkscape.. I used one of them with the Cricut for the shape I used for the quote. "see that guy over there with the black hair and glasses, he's the guy I'm gonna marry!" It was a friday evening, July 1971 and I was working at Suriano's Restuarant in Sault Ste Marie, Ontario. We each had our tables and these two guys had just sat down at a table assigned to another waitress and I was explaining to her why I wanted to serve one of her tables. She then asked me when I got engaged and I told her that I wanted to serve them so that I could meet him. They kept coming into the restaurant for the month but I wasn't having much luck until one night he asked me if I would like to go to Thunder Bay with them. Not the thoughts that should have been going through my mind were things like, "I don't even know this guy's name, and that is a long way to go with a complete stranger".. but oh no, not me, I couldn't get "yes" out quick enough. On our way to Thunder Bay we had a bad accident which put me in the hospital for several days and the doctor told me that he barely left my side. I wasn't able to work after I got out of the hospital so I moved him with him, and we have been together ever since. We got engaged at Christmas 1971, and were married February 1972. We were just meant to be. 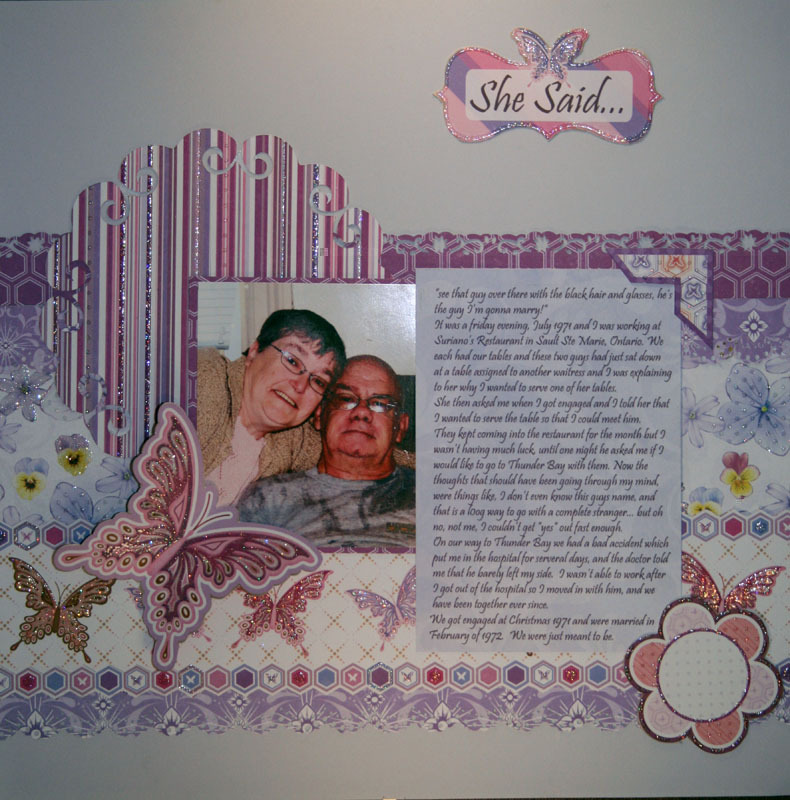 I used paper from Forever in Time called Butterfly Fancy and Floral Fancy both. I used a Paper Studio punch for the edge. I used the Cricut to cut the circle. I printed the title on regular paper from Adobe, then stuck the butterfly card on over where it printed on the paper and reprinted it. I also did the journalling in Adobe and printed it on Floral Fancy paper. That is enough for someone who didn't have anything to say. I am actually making a dent in my photos. 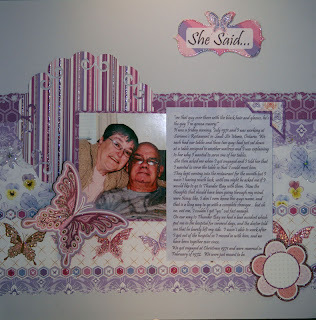 Oh well, give me a couple of months and I will be grumbling about not having any pictures to scrap. wowza girl..you've been scrappin up a storm! lovin all your flower and nature pics...just beautiful..and that lo of you and allen is so sweet...love the journaling! keep up the scrappin chickie!